The number of dogs suffering from hip dysplasia is increasing dramatically. Doctor Bark dog cushions exactly meet the demand for orthopaedic support which these dogs need badly. Doctor Bark dog cushions are also first choice for preventing from hip dysplasia and to support young and old dogs with low muscle quantity. Doctor Bark orthopedic cushions are of such premium quality that we give a 15-year guarantee - even if the cushions are washable on the whole up to 95°C / 200°F. 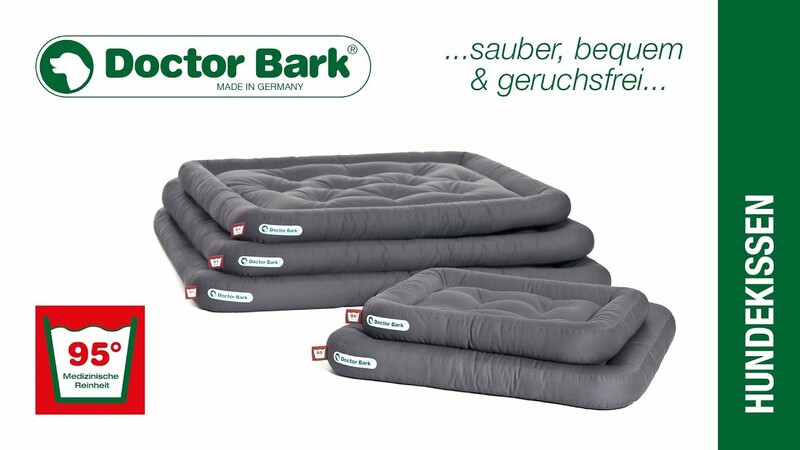 Andreas Schuell, DVM - founder and managing director of Doctor Bark GmbH - realized during his doctorate the necessity of developing dog beds, dog cushions, etc. washable up to 200°F / 95°C for the reason of killing all types of germs and parasites. He was confronted with several dogs suffering from skin diseases. Very often the reasons for the skin diseases could not be diagnosed. The chosen standard treatments did not grant lasting success by most of the patients. Finally Andreas Schuell had an idea and sent a patient’s dog cushion to the microbiological laboratory for an analysis. The results confi rmed his suppositions. The dog cushion was extremely contaminated with germs and parasites. Countless tests followed and it was proven that only washing dog cushions and blankets at 200°F / 95°C will kill germs and parasites and helps dogs to stay healthy. Up to now there were no dogs’ resting places available on the market which were washable at 200°F / 95°C in the whole. From that day on Andreas Schuell knew how to ease a main dermatological problem with dogs. He did not rest until he fi nally had developed the prototypes of the dog rest-places which met his imaginations. They had to be durable with the claim of high orthopedic standards. to set up a production centre for his dogs’ resting- places. This specialist was found pretty soon. He was enthusiastic about the idea and after only four months of time and an innumerable number of prototypes the fi rst line was ready to go into production.